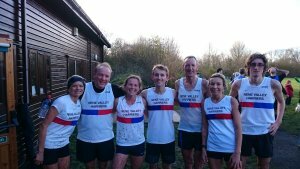 Nene Valley Harriers were clear winners of the sixth and final Frostbite Friendly cross country league match at Huntingdon’s Hinchingbrooke Park on Sunday (March 2nd), and took the senior team title as a result. Here's Ruth Jones' report. The overall winner on the day was Cambridge & Coleridge’s cross country supremo, Sullivan Smith, followed in by top steeplechaser David Connell from Hunts AC and Riverside’s Alan Turnbull. The Cambridgeshire and Lincolnshire-based club beat their closest rivals, Hunts AC, by 181 points on the day, and by 95 points to 87 overall to take the title for the second time since joining the popular local running league ten years ago. Their junior athletes were 7th team on the day, and 5th overall. The hosts, Huntingdon-based BRJ, had to alter the route for the 5m race at short notice due to the usual course being dangerously water-logged. NVH had three men in the top ten, with Lloyd Kempson, Michael Moore and Mike Chapman working hard to come 6th, 7th and 9th respectively. Adam Birch, James Vernau and Sean Beard made up the team in 14th, 15th and 21st position to ensure they set the club up for a strong chance at clinching the title. However, the teams must be made up of three women as well as six men, and the ladies didn’t disappoint. First in for the club and taking the top female spot for the fourth time this season was Tracy McCartney in 35th place, earning her the Senior Runner of the Series trophy as a result. Second lady in for the Harriers was Yolanda Gratton in 93rd position. Yolanda recently married marathon running legend Mike Gratton, who ran 2.09 in London in 1983, and is an accomplished endurance runner in her own right. Closing the winning team in was Louise Blake in 147th place out of 340 finishers. NVH’s first junior to cross the line and 4th female overall was Megan Ellison, who out-ran all of her male club mates. The first male youngster to finish was Codey Holland in 43rd place, less than a minute behind Ellison.